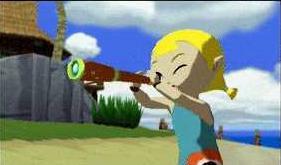 The game begins on Outset Island with a young girl named Aryll searching for her brother, Link. 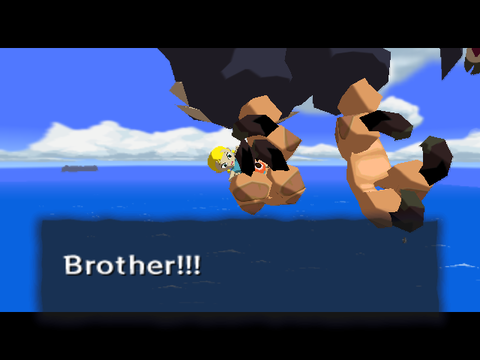 When she finds Link atop the island's watchtower, she wakes him up and reminds him that it's his birthday! Aryll tells him that their Grandma is looking for him, and that she is waiting for him in their house. Aryll's most cherished possession is her Telescope. At this point, you will gain control of Link. Climb down the watchtower ladder and run across the long pier at the bottom of it. When you get to the mainland, go west and cross over the bridge. Continue along the footpath until you reach your Grandma's house at the northwest end of the island. Enter the house and climb up the ladder inside. You will find your Grandma in the loft. When you talk to her, she will give you the Hero's Clothes as a birthday gift. Your Grandma will tell you that it is customary for the Outset people to where green clothes when they come of age. When she notices that you don't look very happy about wearing a thick tunic in the hot weather, she tells you that you only have to wear them for one day. Grandma also mentions that you are now the same age as the hero spoken of in all the legends. She adds that, long ago, all boys of your age used to be trained to use swords; however, now only a man named Orca knows the way of the sword. Grandma tells you that it is also customary to hang the family shield on the wall in celebration. When she finishes telling you about the coming-of-age customs, she'll tell you that she needs to prepare for your celebration and that you should go play with your sister until then. 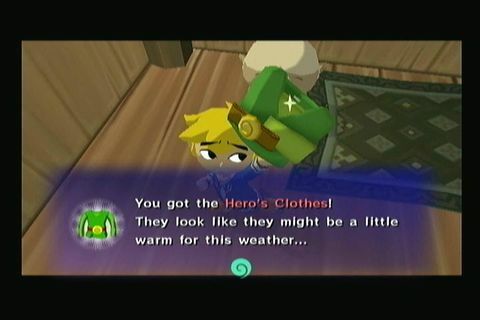 Grandma gives Link the Hero's Clothes for his birthday. Head back to watchtower via the same route as before. Aryll will be waiting for you at the top. When you climb up the ladder, she will give you her Telescope as a birthday present, but only for the day! To use the Telescope, enter the Item Menu Screen by pressing , select the Telescope with , and then press , , or to assign the Telescope to one of those buttons. Press to return to the game. Now press the button that you assigned to the Telescope to use it. Pan in any direction with and zoom in or out with . Once you learn how to use the Telescope, Aryll will tell you to look at the red postbox near Grandma's house. Do as she asks. When prompted, look up into the sky. You will see a giant bird, later revealed to be the Helmaroc King, kidnapping a young girl. A pirate ship off the coast of Outset Island appears in view and shoots cannonballs at the Helmaroc King. When the giant bird is hit, it drops the girl into the Forest of Fairies on the island's summit. 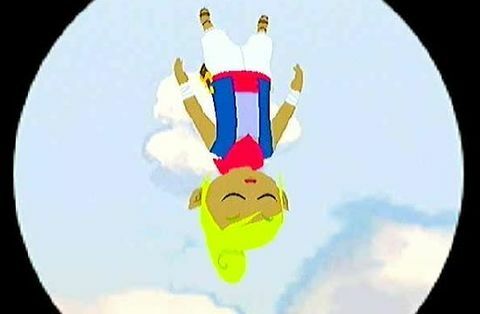 Tetra falls into the Forest of Fairies at the island's summit. Aryll will say you need something to defend yourself with before you try to save the girl, so head to Orca's House. It is the bottom floor of the two-story house near the middle of the island. Speak to Orca, and he'll give you a short swordplay tutorial. Do everything he asks. Once you've completed the tutorial, Orca will give you the Hero's Sword. If you -Target and check the crest on a shelf above the shark, he'll tell you about the Knight's Crest, and ask you to collect 10 of them. You shouldn't worry about this too much, though, since you can't complete it until much later in the game. Orca is ready to teach Link. With your sword, you can now cut down trees. You can get 10 Rupees by cutting down the close group of trees near Grandma's House. There are several Rupees for you to collect on the island. The pig collection minigame, which you can start by talking to a woman south of Grandma's house, can earn you 60 Rupees. There is also a chest with 100 Rupees under your house, which you can get to by crawling under your porch; however, you should wait to collect the chest until later on in the game when you have a bigger wallet. Then head towards the watchtower where you started. Once you're near there, turn right and head up the path, cutting down the barrier of trees. Run straight over the bridge. 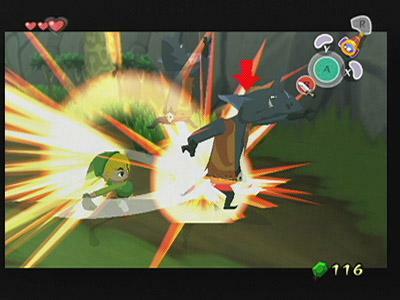 Link will jump over the gap and go into the cave. When you enter the forest, you'll see the kidnapped girl, Tetra, unconscious and hanging from a tree. Just following the contours of the forest and they will lead you to her. Near the start, there's a hollow log. Crawl through it to get 20 Rupees. Just after the log, you'll face a Bokoblin, which should die very easily with the sword fighting that you learned from Orca. Jump onto the stump and then onto the top of the ledge to carry on. Once you reach the girl, two birds will drop two more Bokoblins right in front of you. Just take them out one at a time. In fact, if you -Target one straight away and slice four times, the fourth slice will hit both enemies and kill one of them, leaving the other at your mercy. As soon as you try to rescue Tetra, she wakes up and falls off the tree in her struggle to get down. Her crew mate, a large, muscular man, arrives and takes her back to the Pirate Ship, and you follow. When you leave the forest with them, Aryll waves to you from the other side of the bridge, but before you can meet her, the same large bird swoops in, mistakes Aryll for Tetra, grabs her, and flies away. Now desperate to save her, you ask Tetra to take you with her to where the bird lives. Aryll gets swooped up by the Helmaroc King. Tetra says that in order to go with her, you must obtain a shield first. You remember there was a shield on the wall in Grandma's House! But when you go there, you are confronted by your tearful Grandma, who gives you the Hero's Shield knowing that you must go to save Aryll. 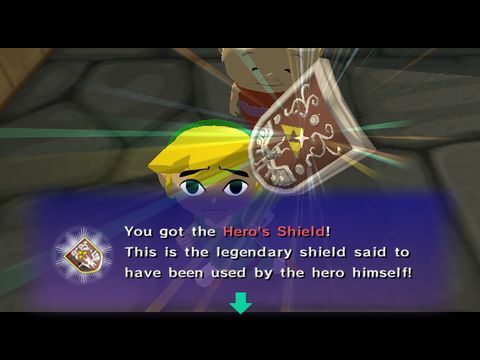 Link gets the Hero's Shield. Before you leave the island, it is a good idea to get the Bait Bag and plenty of All-Purpose Bait from Beedle's Shop Ship, which is docked on a small pier near Grandma's house. You will need these items later on, and it is most convenient to buy them now. Keep an eye out for leaping Fishmen in each map sector. A helping of All-purpose Bait can be used to lure Fishmen to wherever the bait is dropped. Fishmen will paint the nearby island on your Sea Chart and give you useful information about the area. By the time you leave Dragon Roost Island later on in the game, you will want to start filling in your Sea Chart. After returning to Tetra, shield in hand, she agrees to take you. 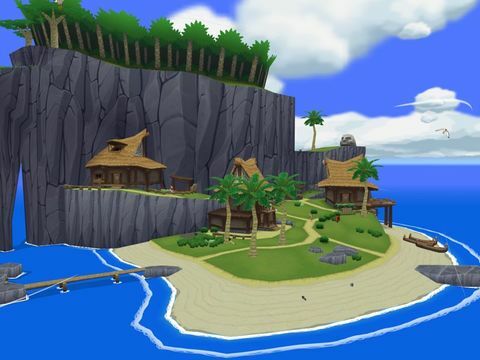 When you have finished your business on Outset Island, you can feel free to leave. An emotional cutscene in which everybody waves goodbye to Link will play. This will be your last opportunity to collect the items listed below for a while, since it will be a long time before you can return to the island. Bait Bag: Buy it at Beedle's Shop Ship for 20 rupees. All-Purpose Bait: It's recommended that you buy about 6 of these. They cost 10 rupees (30 each in the HD version) per serving at Beedle's Shop Ship, so you may have to save up or only buy a few for now. Hyoi Pear: It's recommended that you buy about 2 of them. They cost 10 rupees each at Beedle's Shop Ship. Orange Rupee: Under the porch of Link's house is a path that leads to a small cave. The cave will contain a treasure chest with the rupee. Red Rupee: On the western side of Outset is a house. Go inside the house and crawl under the bed to a secret room. Open the chest here for the rupee. Yellow Rupee: On one of the rocks on the water. Accessible by jumping from rock to rock starting from the bridge connecting the two islands. 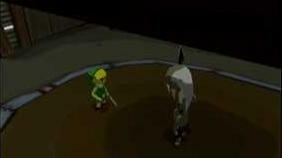 Yellow Rupee: Once you get the Hero's Sword, you'll find a few trees near Orca's house. Cut them down to receive the rupee. Blue Rupee: On one of the rocks on the water. Accessible by jumping from rock to rock starting from the bridge connecting the two islands. This page was last edited on 30 May 2017, at 00:01.